Boomtowns that plan for the long term can improve chances to sustain economic success and avoid a potential bust that can occur. A boomtown is a community undergoing rapid growth due to economic shock. Since growth is desirable for most communities, complacency often sets in when community leaders expect a boom to continue forever. According to Kelsey, Partridge and White (2016), some U.S. communities have witnessed an expression of this optimism in the past, particularly during the energy booms of the 1970s and 1980s. 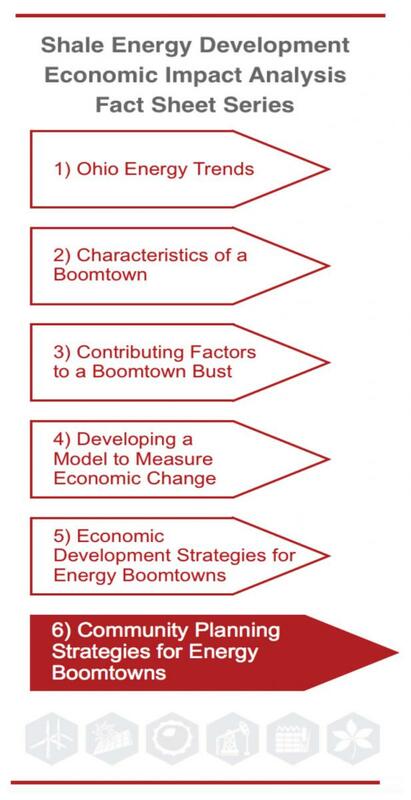 Most energy boomtowns are rural, often lacking the resources and capacity to plan. They also are less likely to be impacted by employment in the oil and gas industry. In terms of percentage of total employment, mining directly represents just 0.5 percent of total metropolitan U.S. employment versus 2.2 percent in nonmetropolitan areas (Kelsey, Partridge and White, 2016). 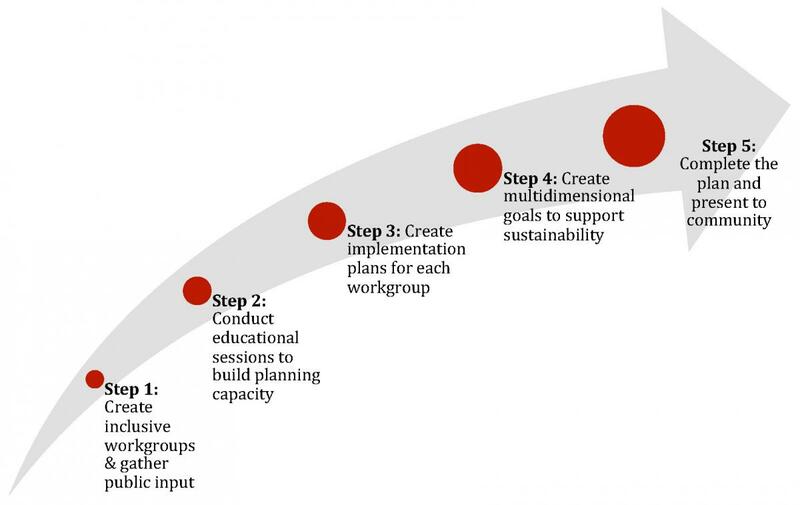 Community sustainability planning keeps in perspective the impacts of energy development by developing strategies to leverage benefits while reducing losses resulting from of the boom-bust cycle. Over-reliance on energy producing industries can drown out entrepreneurship, business development, and the potential for a diversified economy. State and local efforts concentrated on diversification can encourage new business development and attract targeted businesses. Local or regional planning initiatives can earmark funding to assess the economic gaps and opportunities and establish economic development strategies that expand existing or target new businesses. Establishing permanent funding ensures local needs, including infrastructure, workforce development or diversification, for example, are addressed to mitigate impacts and build capacity. Permanent funding addresses the uneven distribution of costs and benefits of natural energy extraction and affords future generations the opportunity to cushion impacts. Permanent funding strategies outlined in fact sheet 5 can include tax or impact fees, legacy or trust funds, or a pay-as-you go approach. County and township government has a history of developing and administering land use guidelines and regulations. Restricting development patterns can help constrain oil and gas mining operations to address infrastructure solutions. Land use controls can be very controversial but necessary to avoid becoming “unwilling sacrifice zones” (Kelsey, Partridge and White, 2016). The literature discusses the need to strengthen the capacity of local governments by educating local officials about the challenges and opportunities of energy development. Regional entities are identified as likely facilitators in the process of linking local governments across jurisdictions to better leverage state and federal level assistance. Building a pro-active energy development network across jurisdictions requires trust, so transparent communications is the recommended approach (Kelsey, Partridge and White, 2016). Extension is an example of an entity that can serve in the role of facilitator and educator. For example, between 2010 and 2015, Ohio State University Extension delivered more than 200 shale energy programs reaching 16,000 participants in the shale-affected region of Ohio. Initial efforts addressed individual landowner needs for legal and financial education, while subsequent efforts transitioned to community-based issues, including permanent funding solutions. An Extension team working with communities in the shale-impacted region of Ohio developed a planning process designed to help communities plan for the short-term and long-term impacts of shale development described in an article published in the Journal of Extension, titled “Building Sustainability in Gas and Oil Producing Communities” (Romich, Bowen-Ellzey, Moss, Bond and Civittolo, 2015). Figure 1 illustrates the process discussed in the article. In addition to regional entities, development organizations or Extension, there may be a need for creating trained circuit-rider shared positions that work across several local governments. This position, as presented in the literature (Kelsey, Partridge and White, 2016), could focus solely on the unconventional oil and gas activity, allowing them to specialize in this area without other municipal responsibilities. The approach could provide local governments expertise on the issue, and help with facilitation, coordination and communication across jurisdictions. Local community planning is an important and necessary process, especially in a boomtown scenario. Because rural areas typically lack the resources needed to tackle planning, help is needed in the form of education, information, and technical assistance. State and regional governments and other organizations, including Extension, should play a role in assisting rural communities in planning for and implementing sustainability strategies. Although strategies can be customized to address area specific changes, they should all take into consideration economic diversification, permanent funding solutions, and land use and environmental considerations. Planning that is focused on building capacity, increasing transparency, and building a strong collaboration across jurisdictions can ensure long-term success.